A tiki bar is tucked into the basement of this impeccably elegant Champaign home, and we can’t take our eyes off of it. Some people show their devotion to South Sea fantasy by dressing up their patio with torches and lanterns, or furnishing the basement with rattan furniture, totems and other tiki tokens. 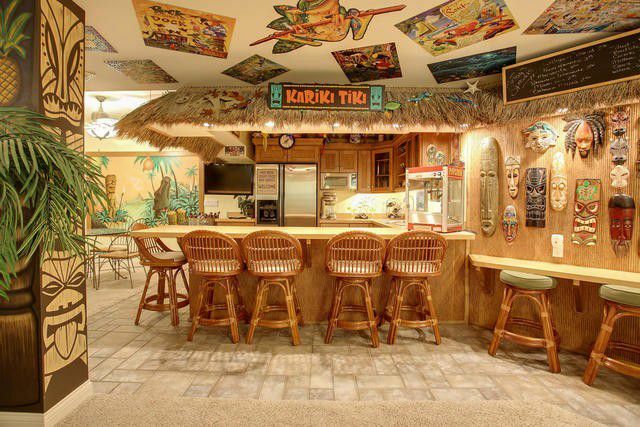 But this Champaign home, which hit the market in late January, goes the extra mile with its full-on tiki wet bar built into the basement. 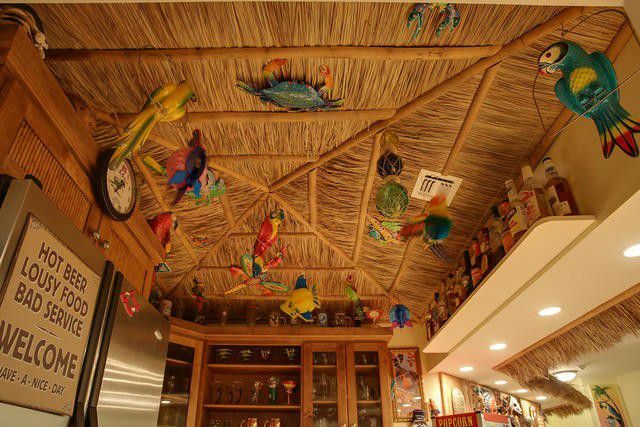 Reminiscent of something you might see in Key West, the tiki bar is complete with (fake) parrots swinging from the ceiling, thatch coming from the “hut” and Polynesian tiki masks on the wall. Looking at these dreamy photos one can almost feel the ocean breeze and hear the Polynesian Pop, and taste exotic drinks served in coconuts. This “Polynesian” paradise is truly a slice of Americana, just located in the 61822. Situated in the west Champaign neighborhood of Lincolnshire Fields, the house was built in 2005. Scroll through the listing and you will see an incredible master bath and a beautiful kitchen, which makes the tiki bar a fun and unexpected surprise. This ranch has 3 bedrooms, 2.5 baths and more than 4,000 square feet of space when you included the fully finished basement. It is currently listed for $485,000; find it on realtor.com. Are you moving to the Champaign-Urbana area or moving within the community (as we like to say, changing houses)? Visit our Moving to Champaign-Urbana Guide. Enter your email address to receive email updates. We respect your email privacy.